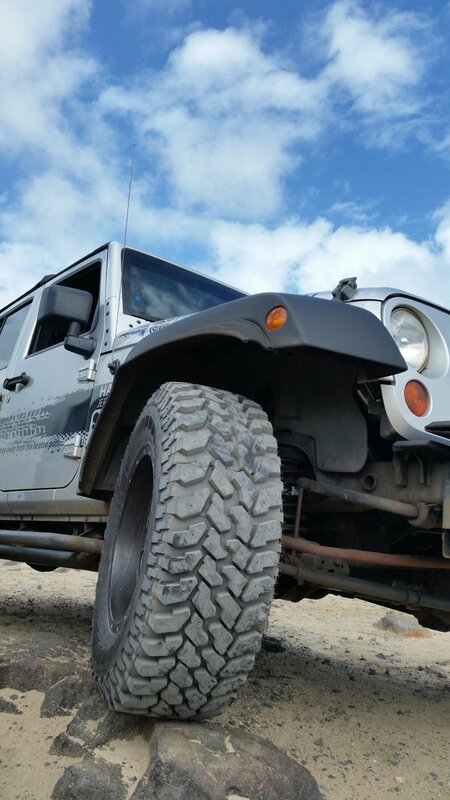 As many social media followers of Hawaii Jeep Tours owner Bruce Fisher likely know by now, the Hawaii Jeep Tours fleet was recently outfitted with five new Firestone tires for each by Bridgestone Americas. “They really came to our rescue” said Bruce “We’re Thrilled!”. 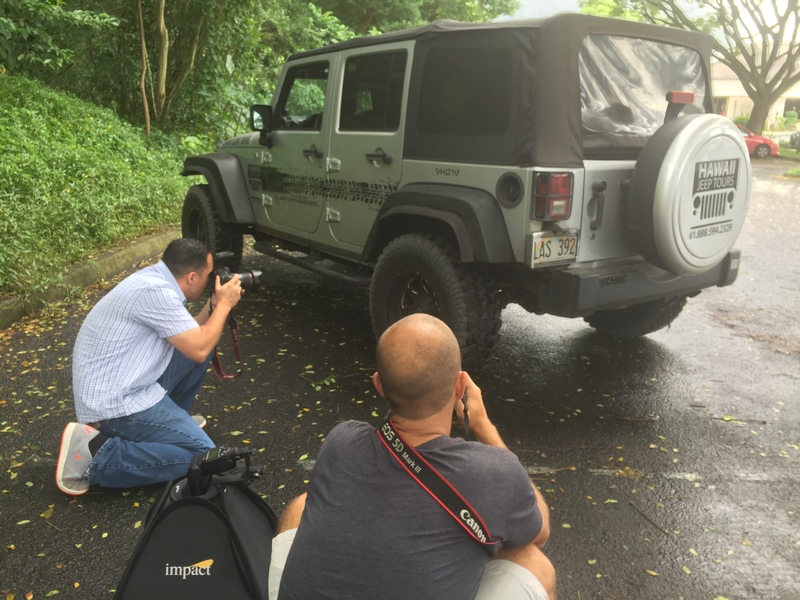 As part of the arrangement, Hawaii Jeep Tours recently took a handful of Bridgestone employees and a group of national journalists on a tour and photo shoot of the newly installed tires at work. We met with Hawaii Jeep Tours guides Kaleo, Sean, and Bo, and after warm greetings of mutual aloha, we rolled up to Aulani. 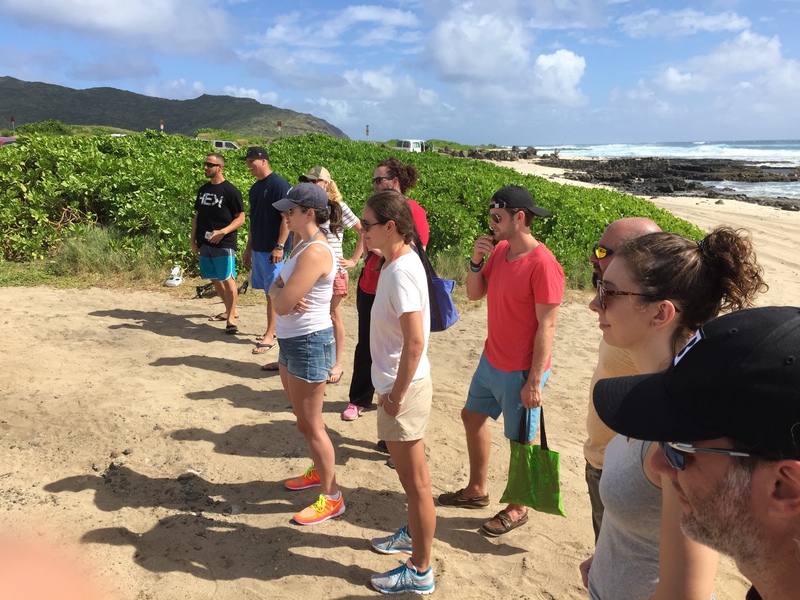 A small army of employees and writers excitedly took their seats in the Hawaii Jeep Tours fleet. After a brief stop to take in the spectacular view at China Walls in East Honolulu, the group met up for lunch and a traditional Hawaiian blessing at a popular spot along the Ka Iwi Coast after a bit of off-roading on the new tires. 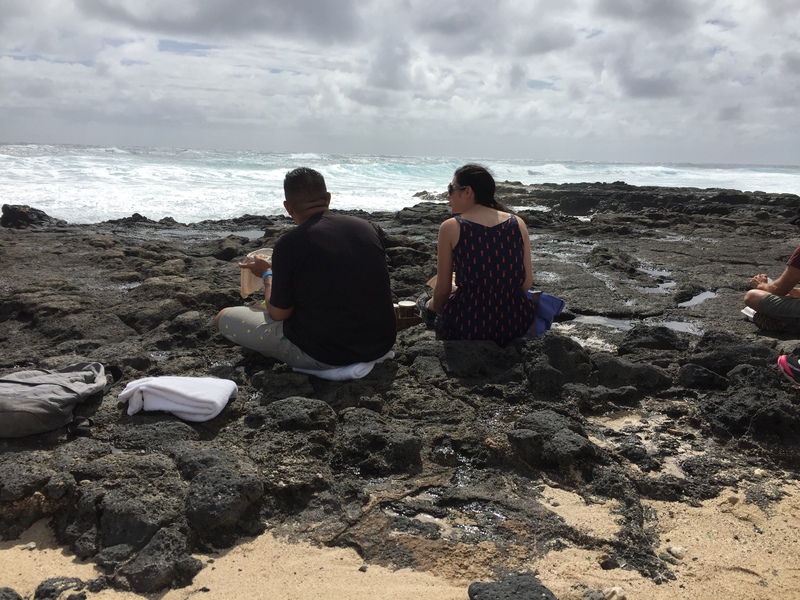 Kaleo’s special knowledge of traditional Hawaiian practices was mesmerizing as he thanked ke akua, or ancestral Hawaiian spirits, for their gifts of life and aloha. He marveled at the power of the moment, indicating the goosebumps the occasion gave him (in Hawaii, we say “chicken skin.) In that moment, he said, our group became family, an ohana. He blew a bamboo horn into the four winds. A professional photographer and his assistant shot some close-ups and we gawked at their drone camera that hovered over us like an insect from the future. Finally, the jeeps were mounted and the tour continued. 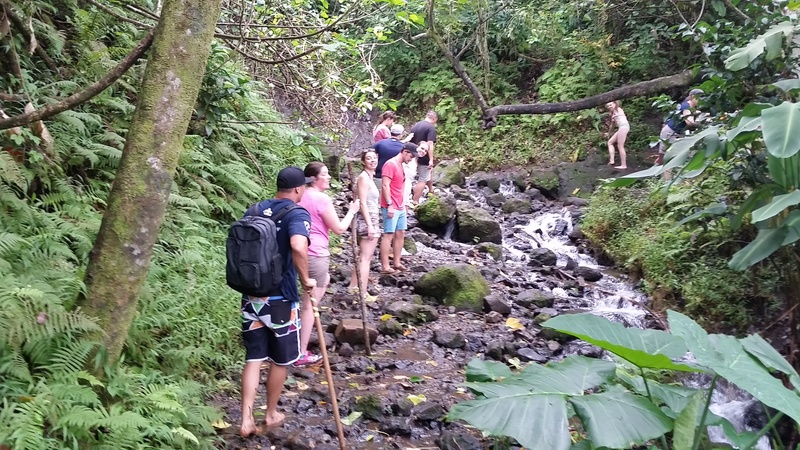 After a stop at the Makapu’u Point lookout, which offers an amazing view of the windward coast, our new ohana gathered at the Likeke Falls trail at the base of Ko’olau Mountains in Kaneohe. Bruce stayed behind with the photographers for another photo shoot featuring the new tires as the rest of the group began the 15-minute hike led by Wayde and Bo, with Kaleo and Sean offering helpful directions and encouragement from the end of the line. The group was astonished that the guides were walking the muddy, rugged trail with bare feet. We left an offering, or ho’okupu, at the trail head to honor the ancient spirits of the area. Kaleo sounded his horn often, saying that it’s important to announce your presence to the spirits there. Kaleo pointed out a hole in the soaring Pali cliffs high above from a break in the cover of the forest. Legend holds that the hole was created by the spear of a powerful ancient chief. We ducked and weaved through a tangled mangrove and passed through a stand of an exotic yellow ginger species. I asked Kaleo what kind of ginger it was. “That’s the yellow kind, brah!” he exclaimed and howled with laughter. Likeke Falls soon came into view. 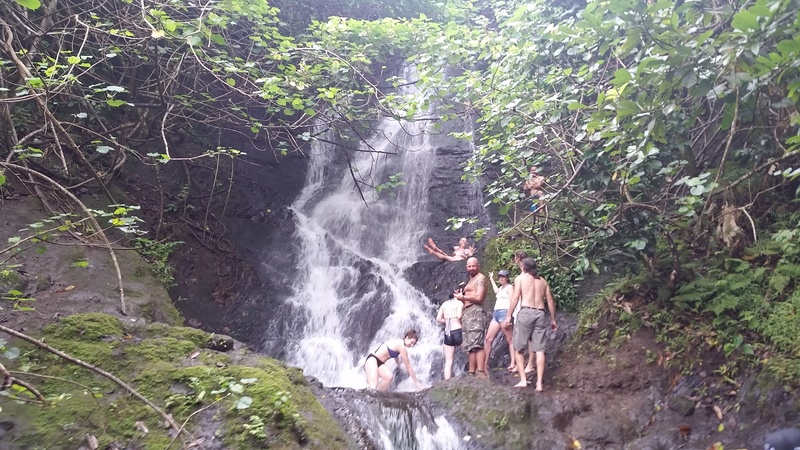 The group gingerly forded a babbling stream, and many of them scaled the slick lava rocks at the base of the waterfall. Shrieks of delight could be heard over the roar of the falling water as the more intrepid of the group placed themselves directly under the flow. After about thirty minutes (and a whole lot of photos) we crossed back over the stream and began the short hike back down the trail. The photo shoot was just wrapping up as we got back to the waiting jeeps. Many hugs and thanks were exchanged and a few last photos were snapped. Kaleo reminded everyone that we were now a family, an ohana. Bridgestone Tires and Hawaii Jeep Tours are now connected as family, and everyone there on that special day would be forever part of that special new family.